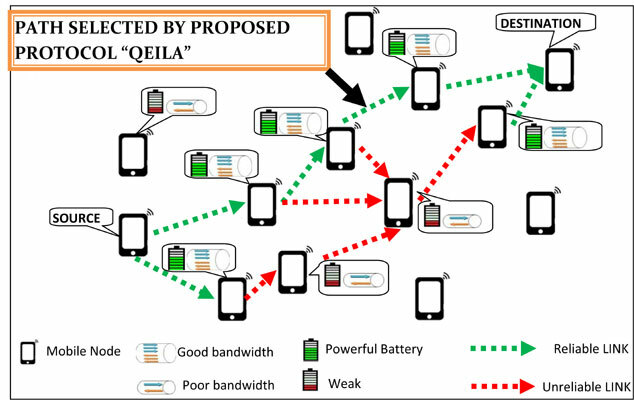 Background: Transmission of heavy and real-time data over wireless links with Quality of Service in Mobile ad-hoc network is a very challenging task. Bandwidth and battery backup parameters are checks for Quality of Service. To provide the Quality of Service in mobile ad-hoc network, the aliveness of a transmitting node has a great concern. Location-aided routing methods for mobile ad-hoc network have gained popularity because of network’s energy saving. Location-aided routing keeps a minimal number of participating nodes for path construction between source and destination, but they did not consider the health of participating nodes that constitute a path. Objective: The objective of this work is harness the location aided routing and builds a protocol which provides Quality of Service in terms of required battery life and available bandwidth. Method: In this work, various patented and non-patented location-based routing and Quality of Service methods for wireless network have been reviewed. The improved location aided routing protocol has been utilized and equipped with Quality of Service check while selecting the next forwarding node for path construction. A novel path preservation procedure is proposed which repair the broken link locally by utilizing candidate next node table. Results: The simulation reveals that the proposed protocol constructs a reliable path consist of trustworthy nodes in terms of battery life and available bandwidth. Conclusion: Proposed work can be utilized for transmitting heavy data traffic in Mobile Ad-hoc network with Quality of Service in real time situation. Forwarding region, expected region, reference line, mobile node, bandwidth, battery backup.